It’s campaign time again – a season of anxiety. Pro-lifers vote for life; something that trumps all else. Those defending a mother’s right to abort her unborn baby, get downright angry at the thought of candidates minding someone else’s business – the business being the life of a baby. Protecting traditional marriages labels one a hater. Then, the HHS Mandate has become a line in the sand that unites all bishops against politicians that seek to twist Catholic arms of business owners who refuse to minimize mortal sin. At the core, it’s those who follow their religious convictions pitted against those who say religious beliefs have no place in politics. Although it would seem to be a more modern argument, it has been around as long as Christianity has been. 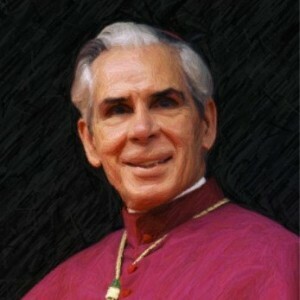 Regarding religion and politics, I was recently taken aback while reading Characters of the Passion (Liguouri/Triumph), a book written by Bishop Fulton J. Sheen in 1947. He takes a look at the characters that played a role in the Passion of Jesus Christ and relates them to our modern world. No one today would call 1947 modern, but the lessons of the Passion held true in 1947 and still do today. In Chapter 3, “Pilate: A Lesson on Political Power”, Sheen disseminated public opinion as it relates to politics. He stated, “Those who have their finger on the pulse of contemporary civilization have probably noted that there are two contradictory charges against religions today. The first is that religion is not political enough; the other is that religion is too political. On the one hand, the Church is blamed for being too divine, and on the other, for not being divine enough. It is hated because it is too heavenly and hated because it is too earthly.” Same old, same old. Sheen portrayed the political/religious process as Jesus stood before the political Pontius Pilate and the religious Annas and Caiaphas. Christ was accused of being too religious before Anna and Caiaphas. Under the veil of mock indignation at the supposed insult to God’s majesty, Christ was declared too religious, too concerned with souls, too infallible and too Godly. After all, they cornered him into declaring Himself to be God. Likewise, pro-lifers are accused of being too religious. Who are they to know the mind of God…to know when life really begins? We are accused of trying to force our religion on others, of being fanatics, of being downright dangerous to a free society. Ultimately, Jesus was sent into the political arena, to Pontius Pilate. There, religious charges would not have prevailed. So instead, he was accused of being too political. Jesus is charged with meddling in national affairs; that He was not patriotic enough. “We have found this man perverting our nation, and forbidding to give tribute to Caesar, and saying that he is Christ the king” (Luke 23:2). “And so throughout history, these two contradictory charges have been leveled against the Person of Christ in His Body the Church. His Church was accused of not being political enough when it condemned Nazism and Fascism; it is accused of being too political when it condemns Communism. It is the second charge that needs specific consideration, namely, that the Church is interfering in politics. Is this true? It all depends upon what you mean by politics. If by interference in politics is meant using influence to favor a particular regime, party, or system that respects the basic God–given rights and freedom of persons, the answer is emphatically No! The Church does not interfere in politics. If by interference in politics is meant judging or condemning a philosophy of life that makes the party or state, or the class, or the race, the source of all rights, and that usurps the soul and enthrones party over conscience and denies those basic rights for which the war was fought, then answer is emphatically Yes! In reality, the Church adapts itself to government, supporting authority. The Church teaches that the state is supreme in temporal matters. But when politics make religious proclamations such as women have the right to end the life of their unborn babies – politics enters into the religious realm and claims supremacy over the human soul. Voting and campaigning against candidates and issues that compete with religion, is not against politics but against a counter-religion. For all the accusations that fundamentalist Christian and Catholic teaching is dangerous to our free society, the reality is quite the contrary. Preaching Christianity is sometimes labeled dangerous and incendiary. For instance, on the issue of homosexuality, the Christian churches are increasingly coming under fire for teaching against homosexual marriages. Never mind that the teaching advocates loving the sinner but hating the sin; politicians claim that it’s not okay to hate the sin. Any teaching against this sin is more and more being labeled “hate” and said to encourage discrimination. Christians are not being allowed moral stances that could be viewed as discriminating against a lifestyle. Such a social straightjacket makes it impossible to teach right and wrong because it will offend the people engaging in the wrong. So when politicians preach a counter-religion message such as the HHS Mandate, which is the government forcing Catholic businesses to offer artificial birth control and abortifacients to their employees, our religious leaders have no choice but to protest. Although the politically correct clamor against invasion of the spiritual, if our eyes are open, we will see that the problem is just the opposite – the invasion of the spiritual by the political. Christ was always and is forever our example. He did not deliver himself from the power of the state although he ultimately held all power: “You would have no power unless it were given to you from above,” (John 19:11). But he never stopped preaching and living the truth. The state is often indifferent to God’s moral laws. Still, we must never give in or give up. We must be willing to bear the marks of Christ as we follow him. Patti has been a guest on “EWTN Live” Television program with Father Mitch Pacwa, S.J. and twice on EWTN’s “Bookmark” television program with host, Doug Keck, as well as on many Catholic Radio programs around the country. She won the 2011 About.com “Reader’s Choice Award”. Her latest books Big Hearted Families, (Scepter Publishers) and children’s book, “Dear God I don’t get it” (Liguori Publications) will be released in Spring 2013. To read more visit Patti’s blog and website.